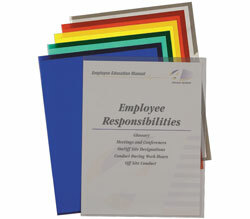 Ideal for classroom and office settings, two-pocket folders are an essential presentation and document storage item. Keep track of letter-size documents by organizing them in these durable portfolios. Sophisticated two-pocket folders hold presentations and proposals. Stylish two-tone material features an eye-catching mirror finish exterior and subtle matte finish interior. Super heavyweight poly material resists tearing. Features business card slot on front inside pocket. For letter size materials. Steel blue/amber orange color combination. 6/PK.